Designer Maya Lin presenting a model of her design for the new Neilson. Maya Lin’s design for Smith College’s Neilson Library is an innovative, contemporary structure that presents a compelling vision for the modern library while respecting the existing building’s historic significance. With an emphasis on natural light, sustainable environmental design principles, and flexible interior space that can be used for a variety of purposes—from contemplative reflection to task-oriented collaboration—Lin’s design re-imagines the new Neilson as an intellectual commons at the heart of the college campus. It also reconnects the college’s science quadrangle with the campus’ historic center, restoring integrity to Frederick Law Olmsted’s 1893 campus plan. Lin unveiled drawings of the new building at an event on campus on October 14. The new Neilson places a premium on flexible space that blends traditional collections with new technologies and a sharper focus on collaborative learning. The new building retains the original 1909 structure, including the venerable Neilson Browsing Room, but replaces the 1962 and 1982 additions with “jewel box” wings—constructed of masonry, wood and glass—that offer open, inviting, light-filled spaces designed to support research, teaching and learning in a variety of styles. Maya Lin Studio developed the design in partnership with colleague William Bialosky and the firm of Shepley Bulfinch. The project will begin in summer 2017 and will be completed for the fall semester of 2020. The new Neilson is distinguished by its ability to reduce the overall massing at the center of the campus while creating a glowing central hub that addresses programming needs and revitalizes the center of Smith’s campus. The building incorporates the character of New England stone foundation walls at its base, while blending in an innovative masonry, wood and glass facade that introduces unique “jewel box” additions to the historic Neilson. A key design element is the building’s strong and innovative use of light. The central atrium is illuminated by an ocular sunscoop—a round, central skylight with a reflective curved wall that captures and magnifies natural light. The oculus’ curves will be calculated to relate to the position of the sun, allowing the feature to serve as a solar ecliptic, and providing a contemporary sundial at the library’s historic core. Curved jewel boxes abut the historic 1909 structure on the north and south sides, replacing the blocky 1962 and 1982 additions with a welcoming, open facade. The new additions, composed of glazing and stacked stone, sit atop a “New England rubble foundation with a modern element,” says Lin, and are laid out to maximize light. In a twist that reflects Lin’s design aesthetic, the jewel boxes are curved, maximizing space and increasing energy efficiency by reducing the surface area of the glass. The curve is partly inspired by the solar ecliptic and is formed in response to the way in which sunlight hits the structure; it also creates welcoming reading and study spaces within. On the outside of the jewel box windows, carefully spaced horizontal louvers filter light, reduce glare and increase mechanical efficiency. On the inside, bookshelves line the stone base, making books an integral part of the building’s design. Curved jewel boxes abut the historic 1909 structure on the north and south sides, replacing the blocky 1962 and 1982 additions with a welcoming, open facade. Identically shaped, but mirroring each other, each jewel box has its own character and purpose. The north jewel box, which looks across the busy Chapin Lawn to Smith’s Campus Center, is intended to be active and more social, housing general collections, reading space, a digital media hub and a café. The south jewel box, on the other hand, is designed to be quieter and more contemplative. The south jewel box will house Smith’s remarkable special collections—one of the largest and finest collections of women’s history in the world. The jewel box additions provide an asymmetrical, curvilinear, cantilevered overhang for the library’s ground floor, which is hidden underground on Neilson’s east side and fully visible on the west. On the north side, a new outdoor amphitheater and neighboring sunken courtyard will provide open-air study and reading areas. In good weather, these spaces are designed to bring the library outdoors; in the winter, the sunken garden provides the feeling of outdoor space without leaving the building. They also draw natural light into the library’s underground level. At the top of the building, Lin has created a new “skyline room,” a top-floor space that provides rare long views, including vistas of Paradise Pond, the college’s athletic fields and the neighboring Holyoke Mountain Range. The skyline room is adjacent to an outdoor patio that can be used for reading, study and informal and formal meetings—one of the many ways that the new building helps to unite the library with the surrounding environment. Viewed from the west, north, and south, the skyline room bisects the old structure, with the new roof expressing itself as a cut in the old roof. The Alumnae Gymnasium —site of the first women’s basketball game in the nation—remains as part of the new library complex, renovated to provide valuable study space, as well as space for the general collection. The Alumnae Gym will be connected with the new Neilson through an underground tunnel, offering easy access year-round. Sustainability is a priority for Smith and for Maya Lin, and a commitment to sustainable principles is reflected throughout the new Neilson’s design. The building’s innovative design—and especially the sunscoop and the louvered jewel boxes—provide natural light to the vast majority of the general collections area, and the sunken garden provides natural light at the garden level. The utilization of the significant grade change allows for the lower level to be set into the slope of the hill on one side while coming to daylight on its western side. 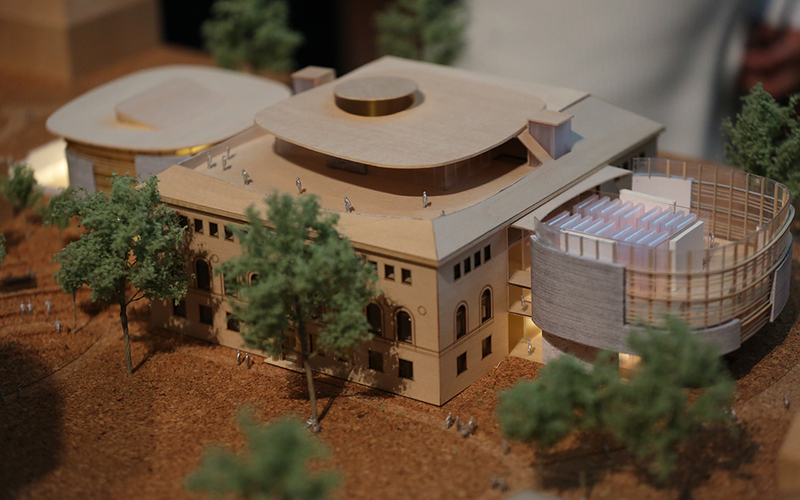 This model of the new Neilson Library will be on display at the existing library building. Lin, working with landscape designer Edwina von Gal (in collaboration with Ryan Associates), restores the integrity of Frederick Law Olmsted’s 1893 campus plan by reuniting a campus bisected by the current library, and once again making it easy to move among the college’s main academic buildings. Originally built in 1909, with long brick wings added in 1962 and 1982, the current Neilson splits the Smith campus, separating the college’s science buildings from the historic campus center. Working within the Olmsted plan, Lin’s design for the new Neilson eliminates the wall created by the current building, unifying the campus and opening the view—and the paths for travel—from the Smith College Museum of Art to the science quad, and from Green Street to Chapin Lawn. Featuring gracious entryways on each side of the structure (“You’ll enter and immediately know you’re in a library,” Lin says), the new library functions as an intellectual crossroads at the heart of the campus, drawing in people from every direction. The new Neilson will be highlighted with significant improvements to the surrounding landscape, recalling Frederick Law Olmsted’s original campus plan. The revised landscaping will effectively reveal and incorporate the 16-foot elevation change between Neilson’s east and west sides, and will also preserve several heritage trees that surround the original 1909 structure. Over the past 19 months—since the Smith College Board of Trustees announced the hiring of Lin and Shepley Bulfinch in April 2015—nearly 1,900 students, faculty, staff, alumnae and members of the Northampton community have participated in more than 30 “engagement sessions” designed to help re-imagine Neilson for the 21st century. integrated space for Smith’s outstanding special collections—one of the world’s largest and best collections of materials related to women’s history. Details of the interior design will be developed over the next several years, as the building is constructed. By the end of March, the structure of a new Neilson Library will become more visible, as steel beams and brick masonry are installed on the site. “Take Me to Your Library!” That’s the theme for Smith Libraries this fall—a message that spotlights a virtual universe of library tools and services. What’s New with the Neilson Project? Work on Neilson Library is set to fully resume the week after Commencement, following a six-week schedule adjustment.